Mold Inspection Company Growing to Service the Demand. Expert Network, Inc. a group of companies in the disaster restoration industry, and its mold inspection company, MoldExpert.com, announced today that they will expand its services from Florida to Texas and Puerto Rico with future plans to continue nationwide. 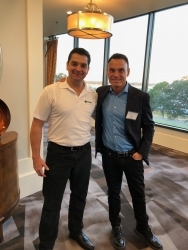 Hollywood, FL, November 14, 2017 --(PR.com)-- Joe Puentes and partners together with his Expert Network team, recently attended a Mastermind meeting in Tampa, Florida, with Kevin Harrington’s Angel Network. They met with key individuals to discuss growing the company and the idea of structuring the company now to provide a path to later take the company public. “The meeting with the Angel Network could be a turning point in our company’s history,” said Joe Puentes, co-founder, Expert Network, Inc.
“They asked us to discuss our model, the market, the need for our services and our plans for expansion. It was exhilarating and meaningful and re-affirmed that we believe we are on the right path for growth,” Puentes added. Expert Network is known by many as the experts in the mold inspection industry. The company has developed software systems to streamline the process to efficiently process a home or business inspection within 24-48 hours. This unique model works to provide every insured homeowner with a comprehensive mold inspection with no out of pocket costs. “Our company is expanding and there is a growing need for inspection services for homeowners who have suffered water damage in their home due to flood, roof or plumbing leak, hurricane or storm, as well as normally occurring mold claims,” said Puentes. “Hurricane Irma hit Florida two months ago and mold has become a major problem in Florida,” Puentes says. The Center for Disease Control warns that mold takes as little as 24 hours to grow. To make matters worse, flood waters which may have contained the dangerous E. coli bacteria brought on by raw sewage co-mingled with the flood waters making the mold problem even more severe. Mold appears in many forms and strains. Left unchecked it causes serious health problems including headaches, tremors, asthma, rashes, coughing, blurred vision, diarrhea and even death. A preeminent mold inspection company in Florida experiencing record growth of over 100% Q3-Q4 2017. Provides mold and bacteria water inspections at no out-of-pocket cost to the homeowner, billing 100% of the fees directly to the insurance carrier. Sets the standards for accurate, detailed and efficient mold inspections for homes and businesses. Plans to expand throughout Florida, Texas and Puerto Rico, then nationwide. Offers education programs and workshops about mold detection and mold problems, training our inspectors in newest and cutting-edge technology. Unique proprietary products to the market including: humidity meters, mold detox and air quality purification products. More than 70 million insured homeowners file over $35 billion in residential property claims each year. One in 35 insured homes has a property damage claim related to wind or hail each year. One in 50 insured homes has a property damage claim caused by water damage.